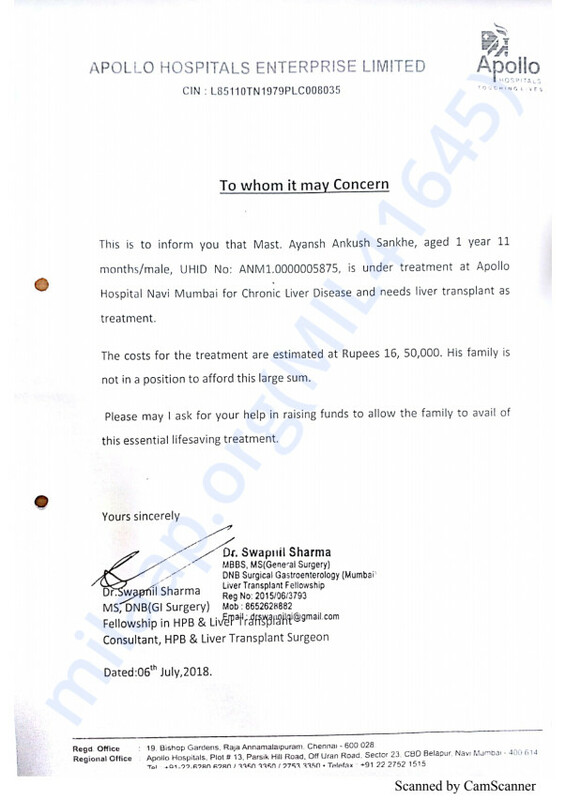 2-year-old Ayansh is suffering from a severe liver disease for which the only treatment is a liver transplant. Please support. Here's an quick update on Ayansh. Ayansh is responding to the treatment and is recovering slowly. We shall keep you posted. With all your blessings, love and support Ayansh is back home and doing well. He has been visiting the hospital regularly for follow ups and is also under regular medication. As his mother, I thank all of you for helping me save my child with your contributions as well as blessings. All the funds raised were utilized to clear his medical bills. Here's a quick update on Ayansh's health. Ayansh is recovering is responding to the treatment and is recovering slowly and is getting discharged this week. God bless you. Get well soon baby.